Arms and the Man was first performed in 1894 but was set nine years earlier, in the midst of the 1885 war between Bulgaria and Serbia. The location was found somewhat accidentally – Shaw wanted a battlefield setting that could plausibly involve a machine gun. But the decision to set it near the edge of the Ottoman empire informed the play's taste for the exotic. As Shaw put it in his opening stage directions, "The interior of the room is not like anything to be seen in the west of Europe." In our production, the eminent designer Julie Lynch is responsible for the numerous lavish and exotic costumes. Her award-winning design work has graced the stages of STC many times before and she has regularly collaborated with her Arms and the Man colleagues – director Richard Cottrell and set designer Michael Scott-Mitchell. The three of them worked very closely in developing the look of this production, with an eye on maintaining the play’s intended exoticness. As Julie describes it, "We explored having the world of the play crafted by paper cutouts and patterns that had a storybook feel. This allowed both Michael and me to consider a lot of exciting visual material, from beautiful old etchings and illustrations to Ottoman calligraphy." 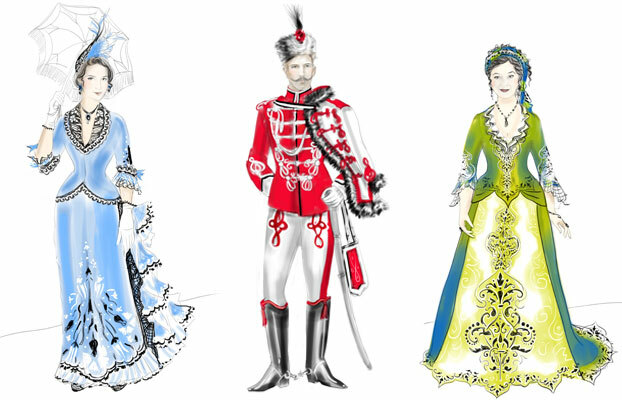 Above: Julie Lynch's costume design drawings for the characters Raina Petkoff, Sergius Saranoff and Catherine Petkoff. These influences have found their way into both the set – an elaborately detailed construction that appears to be a giant paper cutout – and the costumes, which echo the cutout idea in lace detailing and silk-screened patterns. Though the design influences clearly have an imaginative, storybook component, the costumes are still firmly grounded in the period. "We decided early on to set this production in the time and place of Shaw’s intention – Bulgaria in 1885." Period costuming often involves questions of authenticity. For Julie the best response is more nuanced, "Most of the cast was already in place when I began my work, so taking their physicalities into consideration was essential and a wonderful starting point for the costumes. You can never reproduce a period as it was in its day. It's impossible: the people, diet, materials and technologies have all changed. And producing museum replicas is not the same as creating theatre. So, while I think it’s important to have a deep knowledge of the period, you also need to know when and how to break the rules to explore the characters and to tell the story." We think Shaw would probably agree. Though he took advice from a former admiral in the Bulgarian navy on some of the cultural details in the play, authenticity was not a cornerstone for him. In the lead up to the play’s first production, he remarked, "I looked up Bulgaria and Serbia in an atlas, made all the names of the characters end in 'off' and the play was complete." Indeed, for this production, it is the authenticity of Shaw's vision that is at the forefront. As Julie puts it, "Shaw had elected to set the story in an exotic location for a reason, so we held onto that. When you see the piece, you will know you are somewhere in Eastern Europe by the imagery, but trying to be representational and create naturalistic Bulgarian rooms would limit the dramatic potential of the production." in relation to the performer, the text, the space and the audience. I believe you should try to make the three-dimensional costume better than the two-dimensional drawing. Usually no one will see the drawing! In a way, this is the joy of the challenge. Working with the costume makers, the performers, the materials, the wigs, the make-up and all the other scenographic elements to create something better than the idea. The final, realised image of the performer on stage is what we’re all working towards." And that is what we are looking forward to. Arms and the Man will be on stage, in all its fully realised glory, at the Sydney Opera House's Drama Theatre from 14 September to 31 October, 2015.